AccessJ: Why Do Many Japanese Bathrooms Not Have Hot Water? Why Do Many Japanese Bathrooms Not Have Hot Water? ﻿I would have to say that one of my least favorite things about Japan is finishing up my business in a public rest room only to look down at the sink only to realize there is no hot water faucet. Sadly, this happens just about every day in Japan. And it probably wouldn't be so bad if I lived in a tropical paradise. However, I live in a place with negative God-know's-what temperatures and very little central heating. As you can expect, washing hands in icy water only to go out into the cold is not very fun. Therefore, I decided to look at why Japanese public (and sometimes private) restrooms have an aversion to warm water. The simplest answer as to why so many rest rooms are without hot water is the high cost of energy. Hydrocarbons (and by extent electricity) in Japan have almost always always been more expensive compared to North America. Since petroleum products and electricity are pretty much the only feasible way of heating water, any business or residence that wants to have a constant supply of hot water must make a considerable investment in both heating equipment and energy. 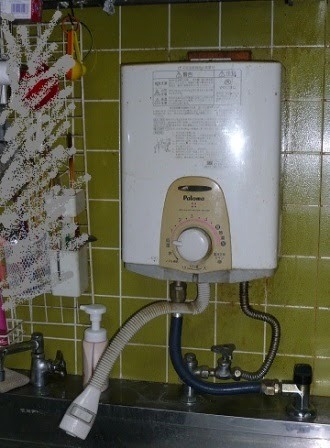 Have heard anecdotally that prior to the 1973-1974 Oil Crisis hot water could be found in many public restrooms all over Japan. However, after the sudden jolt in world oil prices, many public bathrooms shut off the hot water. I have also heard from acquaintances that cold water hand washing is more sanitary. Some how I doubt the veracity of these claims, but you never know. Aside from the high cost of gas, propane, and heating oil, one of the biggest factors that limits hot water taps in public restrooms is that water is usually heated by electricity. Since electricity in Japan is very expensive (compared to North America) per kilowatt, most homes and business opt to use shinya denryoku (深夜電力), to power their water heaters (onsuiki 温水器). Shinya denryoku literally means "late night electricity" and, as the name implies, it refers to an electrical rate only available after 12:00am until about 6:00 in the morning. In some service areas shinya denryoku almost a third of the price per kilowatt of normal electricity. This systems not only necessitates a building with modern enough plumbing to pipe in hot water to all taps on the premises, but also a special electric meter and timer system. 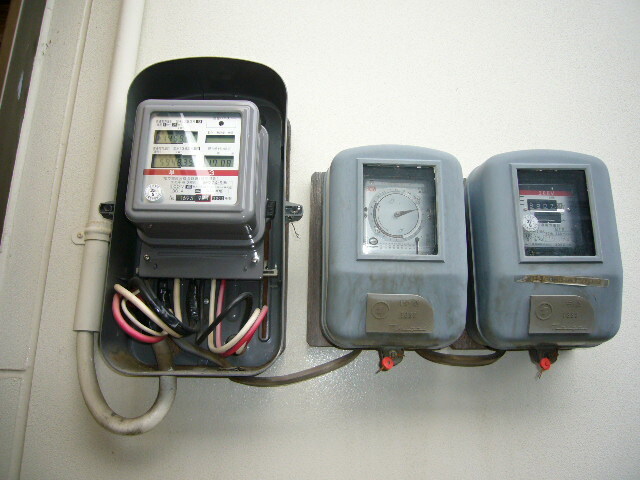 Because shinya denryoku is only available at night, most water heaters turn off in the morning or only use a low voltage current to keep water warm. Therefore, it is very possible to run out of hot water for the day if you use too much. Although most new homes have plumbing that can deliver water throughout the house, traditional Japanese houses and buildings were designed with only localized hot water heating. This means that a water heater (yu wakashi-ki 湯沸器)would only be connected to one or two taps, usually in the bathroom and shower. Most water heaters are located on the outside of the building and are powered by propane or city gas, making them expensive to run for a long time. Most models only heat up on demand, meaning that you have to run the faucet for a bit before any hot water comes out. The other option is an "small instant water heater" (kogata shunkan yu wakashi-ki 小型瞬間湯沸器). This is a rather conspicuous box found in many Japanese kitchens. Rather than relying on hot water from a central source, this device uses propane or city gas to heat water on the spot and spit it out via a separate nozzle. It isn't exactly the height of technological achievement but, but at least it heats up relatively fast. Due to the lack of central hot water in most buildings, they are still a common sight in offices and homes alike. So that concludes our investigation into the lack of hot water in Japan. If you have any experience or expertise to share, make sure to let us know! Anon- Insulation is a huge factor, I think. Most pipes let alone houses are not properly properly insulated, which is a big problem. However, this mainly applies to structures built before the 2000s. I can't really comment to the efficacy of the small water heaters but if used in moderation in a small house I imagine they would be a lot more eco friendly as compared to a big boiler. I guess it just comes down to more of a confort issue for me. Come to think of it, it's odd that there is no hot water at the sink although many of restrooms of households, offices or public facilities are equipped with a washlet toilet attachment. Good point. And even the washlet is often temperature controlled. Anano #2- I think that most bathrooms aren't heated at all, hence the need for robo toilets. And good kanji catch! Thanks for the heads up.